Custom reports allow you to extract data and present it in your own report. You can choose to save custom reports you create in existing, supplied report folders, or in custom folders. The data available to use in custom reports are grouped into sections. Existing report templates, including those previously created as custom reports, can be used to create new custom reports. However, if that template is updated whilst being used by other custom reports, the changes will not be filtered through. 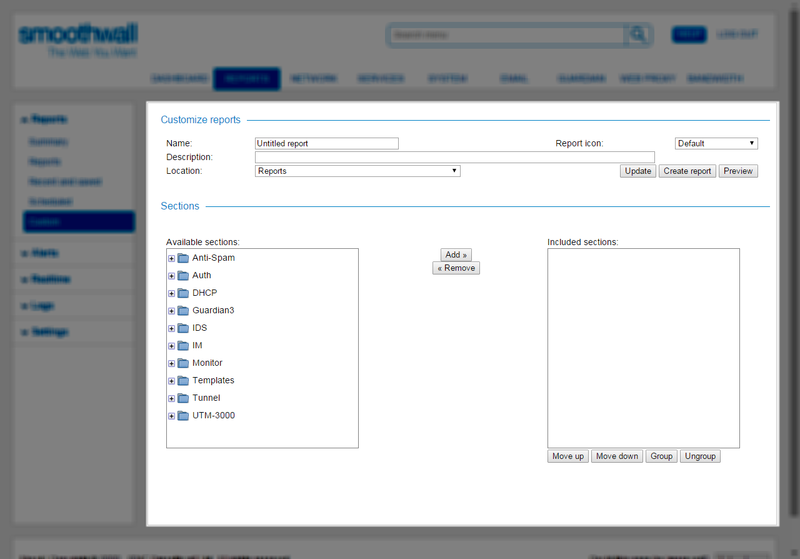 Note: The report sections available for custom reports depend on the Smoothwall installed, and the modules licensed. 1. Go to Reports > Reports > Custom. • Name — The name of your custom report. • Report icon — Choose a relevant icon for your custom report from the drop-down menu. • Description — Add an optional description for your custom report. This text appears under the report link in the Reports page. • Location — Choose a relevant folder to store your custom report from the drop-down menu. For a detailed description of how to create a new folder, see . 3. Within the Sections panel, expand the relevant Available sections folder. Highlight the required report section by clicking it. 4. Click Add >> to include the report section in your custom report. • Description — The description of the included section. • Options — Some sections deal with only a limited set of data, such as a single group or a single IP address, in which case this tab will not apply. For other sections, you will be prompted to choose the type of data for the report, such as, incoming or outgoing traffic, interface number, and so on. • Results — The results returned for that section. This is useful if the section is used in feed-forward reporting. For more information, see About Advanced Custom Reports. • Export — This tab displays those data items that a user can be prompted to enter to narrow the search when running the report, such as, username or IP address. The exported options appear on the Advanced >> table when running the reports — see Generating Reports. An advanced custom report is typically one where the report data can be taken from different aspects of the Smoothwall’s logs, such as, user activity, browsing history, bandwidth used.  Grouping sections — You may want to group sections together to allow multiple, logically similar sections to share reporting options. For example, you can group together sections which require a username to be entered for the report to run against. You can also create subgroups within grouped sections.  Re-ordering sections — You can reorder included sections to create a logical report. If you are using feed-forward reporting, sections that provide feeder data should always be before those sections utilizing the data.  Feed-forward reporting — Feed-forward reporting allows a section’s results to be used as the source of options for subsequent sections. For example, a network interfaces section can be used to gather the configuration details of external network interfaces, whilst another section can use that data to display the bandwidth usage per interface.  Iterative reporting — Iterative reporting is where a section is repeated in the same report, but with a few details changed.  Show user activity for each user, by department, during a specific date range. The user activity should be broken down into the websites they were looking at, the categories those websites belong to, and the length of time spent browsing. 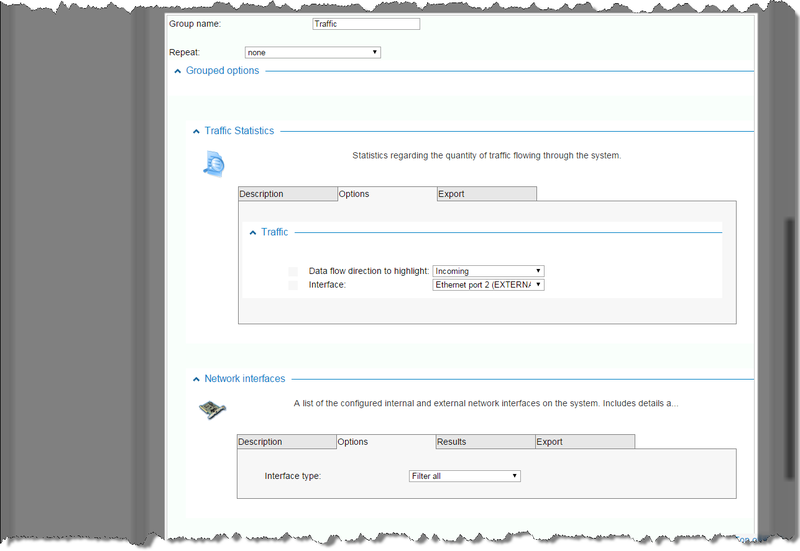  Show the bandwidth used for configured interfaces, including both incoming and outgoing data. Ignore internal data.  What data needs to be grouped together?  Which groups, or data should be repeated? 1. Create a custom report as detailed in Creating Basic Custom Reports, adding multiple report sections. Do not click Create report. Tip: You can highlight multiple available sections before clicking the Add >> button to add multiple sections at once. a. Within the Included sections panel, highlight those sections you want to group together. Note that you do not need to hold the CTRL button down to click multiple sections. c. In the report panel underneath, those selected sections will be grouped together. Add a meaningful Group name. d. To ungroup grouped sections, highlight the group name in the Included sections panel, and click Ungroup. e. Note that ungrouping sections may affect any feed-forward, iterative, or group options you have configured. a. Within the Included sections: panel, highlight the section you want to move. b. Click either the Move up or Move down button as required. c. You can move groups in the same manner by highlighting the group name. Note that you cannot move sections outside of groups. a. Create a report group as detailed in step 2.
b. From the Repeat > Using results from a section: drop-down menu, select the section you want to feed-forward from. c. Only suitable sections for feed-forward reporting will be listed under this heading. The resulting data is listed in the Results tab for that section. d. Click the Update button. The feed-forward section will be removed from its parent group, and displayed in a new (feeder) section. e. Configure any extra configuration options for the feeder section. b. From the Repeat > Based upon grouped option: drop-down menu, select the option that best suits the section you want to be repeated. c. Note that if a grouped option is chosen to be repeated, it will no longer be available as an option from its parent section. d. Click the Update button to display extra configuration options for the repeated section. e. Configure any extra configuration options for the iterative section. f. Click Update again to save your extra configuration settings. You can invite other members of your organization to view the report generated. This is via a unique shareable link, generated in the Smoothwall user interface. At the time of writing, the link is only valid for use for exactly seven days from the point of generating. For example, a URL generated at 14:15 on Tuesday is valid until 14:14:59 the next Tuesday. 1. From the top right of the generated report, click Share. 2. If required, you can choose to password-protect the link. Users who have the shared URL are prompted to enter this password before they can view the generated report. The password is automatically generated by the Smoothwall. You cannot enter a password. 4. From the Share report - <report_name> window, click Copy. This copies the Link, Password (if selected), and Expiry to your device's clipboard exactly as displayed to you. 6. Paste the report details to the required share medium, for example, email. Note: The sharable URL is regenerated every time the Generate link button is pressed, with a different report identification string each time.